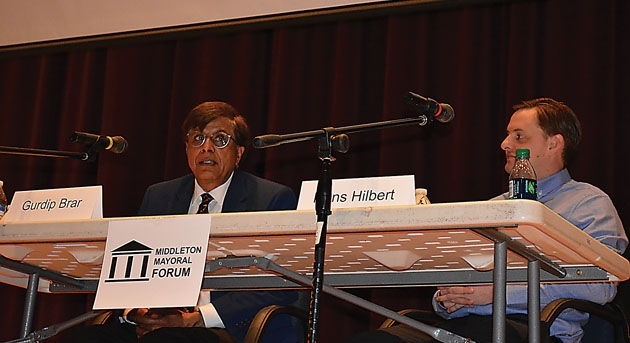 Mayor-elect Gurdip Brar (left), seen here debating Hans HIlbert at the Middleton Performing Arts Center last month. One candidate promised a “new vision.” The other pledged to continue the course charted by outgoing mayor Kurt Sonnentag and the majority of the current city council. The voters have spoken, and the new vision has won. District 2 alderman Gurdip Brar defeated District 7 alderman Hans Hilbert 51.8% to 48.1% on Tuesday in a tightly contested race to become the City of Middleton’s next mayor. Brar, a longtime critic of excessive spending, of what critics see as rubber stamping of staff initiatives, and of the status quo in general, said in a recent mayoral debate that the community was ready for a change. Speaking from his home just moments after learning of his victory, Brar said he was “really pleased people put their faith in” him. Brar, a retired Ph.D scientist who grew up on a farm in India and has been an active member of the Middleton community for more than 30 years, has always been wildly popular in his own aldermanic district. But he lost his initial bid to unseat Sonnentag back in 2009, so Tuesday’s victory appeared to be something of a vindication for him. “I guess I was listening to my constituents, and now I’ll listen to the whole city,” he said. Brar’s win does set up an interesting dynamic between the mayor-elect and the rest of the city council, all of whom (except for Brar, of course) endorsed Hilbert for mayor. Hilbert also had the endorsement of Sonnentag. “I’ll have to persuade the city council, of course, but as mayor you provide a vision,” he added on Tuesday night. Hilbert was not available for comment following the announcement of the election results.